It’s performance, reliability, quality of print and competitive costs are just some of the factors behind the success of previous machines to the d-Color MF254 multifunctional system. The upgraded, improved version is enhanced with many new benefits and features specially developed to meet all the demands of the modern office. The d-Color MF254 features the new 9” touch-panel integrated with a simple, user friendly interface developed in line with technology found on PCs, tablets and even your smartphones. The screens on the machine and its functions can be customised to meet any specific usage needs you might have, this would use “widgets”. This multifunction machine makes printing, scanning, document storage etc. a breeze. It utilises a full colour touch screen monitor which doubles up as a web browser. Printing both Mono (black and white) and full colour at a speed of 25 pages per minute to a very high quality. 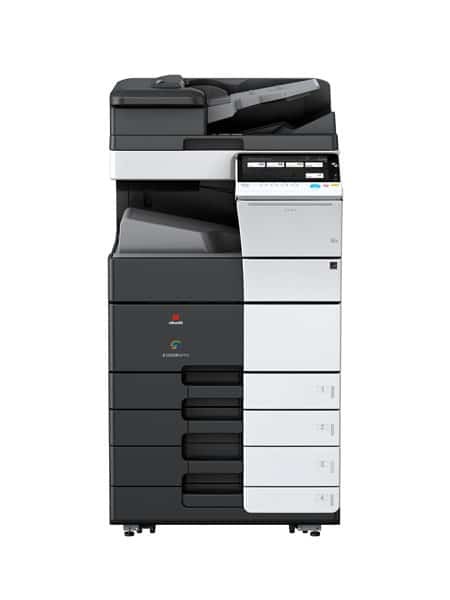 In-built bluetooth and Near field communications (NFC) connection on the operator panel next to the touch screen mean you’ll no longer have to mess about spending time sending documents from your phone to email, then printing the email and heading back to the printer. You can just connect and print. Taking advantage of Airprint® and Google Cloud print means you can print from anywhere around the world. On holiday but need someone in the office to send something out in the post for you? Just click print and let them know where to send it. A massive 6650 sheet capacity means it’ll not need filling up that often. An in built hard drive means any documents you regularly print can be printed at the touch of a button. Just find and click print. The Olivetti MF254 is designed with volume and speed in mind. The basic capacity of the print trays is 1150 but this capacity can be increased up to 6650 with additional paper trays. The front trays are removable to which means if there are any paper jams its very easy to gain access where you need to. With both Airprint® to enable you to print from any iOS device such as your iphone or Ipad and also Google Cloud print means you can install a piece of software and print from wherever you are.